The nice folks over at Ile de France have offered to give one lucky Plain Chicken reader this awesome prize pack! 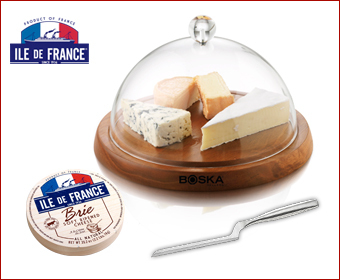 The prize pack includes a cheese board, dome, cheese knife and various Ile de France cheeses! To be entered to win, just answer the following question in the comments section of this post - What is your favorite kind of cheese? Contest ends Friday at 5:00pm CDT. One entry per person, please. Winner will by chosen by Random.org. I can't decide between cheddar and goat cheese! My favorite cheese is Fontina. It is so creamy and so gooey when melted. Has just enough kick to it. I love using it on pizzas, alfredo sauce, pasta, to make cheesy soup and also in breads and sandwiches! Love Fontina! My dad was a professional cheese maker and then supervised at the factory. We had the great appreciation of cheese. Now that my father has passed for 2 years now, cheese always reminds us of him. I love Cheese!!!! Brie is another good one, I think I just really love creamy soft cheeses the best. I think France and Italy make the best cheeses in the world! We love to eat cheese in our house and always have cheese ready for guests, that's why I would love one of these. It would be perfect for us! ILE DE France cheeses would be well appreciated in my home. It's a snack and a great addition to so many foods and savory pastries! My daughter Sofia always says, More Cheese Please!!!! Ahhh, The Power of Cheese! Either sharp cheddar or Feta. I love cheddar to you can eat it alone or with other foods and mix it with other cheeses for fantastic-ness. I don't believe I've ever met a cheese I didn't like - but I'm really loving goat cheese lately! I love blue cheese and beets! I eat almost everyday!! Cheese is so good for the soul. I think my favorite is havarti. That is yumminess. Definitely feta or goat cheese! I love softened brie on served on a salt block with pears! I love goat cheese, it's creamy mildness is my favorite. It's good alone, or in recipes. The perfect cheese. I love cheddar, namely aged Tillamook cheddar. My favorite "nice" cheese is smoked gouda, but my favorite cheese with grapes and crackers is colby jack. Mmmm!!! I LOVE goat cheese and think it makes everything taste better! Baby Swiss! Great giveaway Stephanie. I have to pick ONE? Hmm. I guess I'd have to go with cheddar. It's just so versatile. I agree...have yet to meet a cheese I don't like! I love Swiss though...could eat that all day long. Definitely love most cheeses, but brie is a current favorite! Is it crazy that this changes depending on my mood? I would have to say that right now it is Gruyere. I'd love some right now with sage and spaghetti squash. YUM! I really like cheese so it's hard to pick. I'm going to go with BLEU! do I really have to pick just one! brie is my go to for snacking and cooking and appetizers etc. last week I was making sandwiches with gouda, and made a few recipes with fontina. Oh YUM! If I had to pick just one, I'd say baked Brie is my favorite!!! Thanks for the chance to win! If I had to pick one, it would be Swiss! I LOVE sharp cheddar!!! So yummy!! Cheese is my ALL time favorite food!!!!! BRIE...plain, with bread, crackers, grapes, apples, baked with sweet or savory...it's ALL good!!! mmm, I guess right now I am loving Brie and Gorgonzola. Brie is definitely my favorite kind of cheese! I have to pick? Oooh... pepperjack, or blue? or white cheddar? what about Munster? I can't decide! Brie, or gouda, or blue, or feta, or goat. I really just love all things cheese. War Eagle! I love any form of blue cheese and have just recently tried and really liked gorgonzola! Mozzarella. Started to say swiss because it is much easier to spell. I love Gouda and Havarti! Brie is my most favorite! YUM! Gjetost is my favorite. A thin planed slice on a cornmeal cracker and a dollop of jam is a great treat. It is a tie between cheddar and Gouda. Love them both! I LOVE CHEESE, but if I HAD to pick one just to snack on, it would probably be Havarti with dill. So yummy. I love all kinds of cheese, but I would have to say Fresh Mozzarella! I love Gorgonzola with figs or pears. But any kind of STRONG blue cheese is also fine. Cheese is my chocolate!! I'd rather have cheese than anything. My favorite? geez! That's hard! mmmmm.....maybe haloumi. Gotta love a cheese you can fry! My favorite, ordinary, easily accessible cheese is big eye swiss. I also love feta and there is a cheese store in Osceola, MO, Osceola Cheese, that sells a Buffalo chicken flavored cheddar - it's is absolutely delicious! Unfortunately, the store is more than two hours away from me, so when I hear anyone is going that direction, I beg them to pick some up for me. There are too many good choices and i love cheese on everything! My top three would be goat cheese, feta, or gorgonzola! Smoked Gouda is my favorite cheese. Aged black wax rind gouda or brie baked on grilled chicken with pesto. I love provolone...it is so light but makes anything taste better! Soft warm brie with fruit is my idea of heaven. Unsmoked semi-aged real Dutch Gouda! Oh yeah! My latest favorite is Port du Salut. My alltime favorite is between ricotta, mozzarella, and of course cheddar. LOVE THE GIVEAWAY!! I am a fan of Ricotta and Parmesan Cheese. More like what kind of cheese DON'T I like. I LOVE CHEESE. I could never be vegan. It's a toss-up between super extra sharp cheddar (white please), or blue cheese. Or maybe goat cheese (on a pizza). Oh, that's a hard question! I love so many cheeses. Growing up my favorite was gouda, as an adult bleu and goat cheeses have to top my list. Yummmmm. Drunken Goat cheese or Stilton with cranberries are by far two of my favs when putting together a cheese plate! I love Munster room temp and spread on a Nabisco Sociables Cracker. It is heaven! Burrata or parm or chevre or brie or truffle cheese or Locatelli Pecorino Romano or English coastal cheddar. I like a lot of cheeses. I love all kinds of cheese but Brie is definitely my favorite!! Havarti and Brie cheese are delish. I am nuts for all cheese so any would do!! My favorite cheese is sharp cheddar, I don't like strong, stinky cheese. I can't pick just one! I love cheese!! Reading through the comments, I kept thing oh yeah, that one, then, no, maybe that one... If I have to choose I'll say Havarti for today. I love feta and fresh mozzarella! I'm on a cream cheese kick right now but I love all kinds! I love a nice melty brie on a cracker with some type of jam. YUM! Country store red rind hoop cheese! But, I really luv it all cause I'm a big rat and I'd be in trouble at your house with all those cute kitties! I adore most cheeses, but if I must pick a favorite, its a toss up between brie, baked w/butter & almond topping on french bread or blue cheese. I love goat cheese! I discovered it while traveling in France 12 years ago. My favorite cheese is Feta...but I just had gorgonzola for the first time this weekend and I like that one too. drunken goat's cheese! I could eat blocks of it every day. Feta, is my favorite cheese! Especially when it is on salads. Picking a favorite cheese is like picking a favorite child...just not possible. The best I can do is answer for today... today I would say.... gruyere... tomorrow the answer will change. Picking one kind of cheese is too hard, but I guess if I had to choose it's be a Colby Jack blend! A really good Parmesan...or cinnamon goat cheese! I'm not a big fan of cheese but I think I could be. I think I just need to try new flavors and varieties. I would say Mozzarella is my favorite though. I LOVE cheese,esp sharp cheddar cheese ! I am currently like colby-pepper jack! I haven't met a cheese I dont like, but my 2 favorites are goat and brie. I love just about any cheese - brie, cheddar, havarti, gouda, even lowly string cheese & Velveeta!! LOL! It's impossible to choose! I probably eat Cheddar the most. Great giveaway! Brie!! I love Brie - thank you for the opportunity to enjoy first class cheeses. My favorite cheese is definitely cheddar! I love many of types of cheese but if I had to pick just one ... my most favorite would have to be Gouda!!! I love cheese and as boring as it may be, I'd have to say that Extra Sharp Cheddar is probably my favorite. I will probably be totally made fun of for this....but Kraft 2% Deli Deluxe American cheese. Hands down. I love that stuff. i could live entirely on cheese alone, i love it so much! i think my favorite is brie! please enter me in the give-away, thanks! I had some delicious fried goat cheese at a restaurant that I'm still thinking about! man- that's hard to choose - I would go with brie or feta! I love cheese though!! I love goat cheese, especially with pears.